When we talk about quality skin care, the French cosmetic will first come to mind: Exclusive top quality products, made under the strict supervision of prominent experts. And if we add impressive ingredients originating from French vineyards, we get unique cosmetic brand Caudalie. As a lover of micellar solutions, it was the first product from Caudalie I wanted to try. Caudalie micellar cleansing water is used for removing makeup, as well as regular skin cleansing. Advantage with this kind of product is in removing all dirt and makeup, with no mess or greasy residue on skin surface. Caudalie micellar water comes in a white, quality plastic bottle with a pump on its top. On the label you can find basic information about the product and ingredients list. Shelf life is 9 months from opening, and the bottle contains a total of 100ml micellar solution. There is also a larger 200ml package on the market, but for first purchase, a smaller package is good for the trial. Also, it's good if you plan a trip, and you want to take as little cosmetics as possible. Interesting fact is that Caudalie in 2006 stopped using parabens in its products. Also, Caudalie cosmetic is an animal ingredients and mineral oil free. And the most important thing to me, there is no sodium lauryl sulfate surfactant used in Caudalie micellar water. Usually it is used in the product as a foaming agent, but it removes skin precious natural oils which can cause dry skin and irritations. The Caudalie micellar water contains plant glycerine that extensively moisturises the skin, as well as plant origin surfactants for gently skin cleaning. Instead of the parabens, micellar water contain completely safe and natural preservatives used in the food industry. In Caudalie micellar solution you will find grape water made from organic grapes, rich with minerals that soothe irritated skin, and sugars acting as a skin moisturizer. Also, there is an organic extract of chamomile flowers, a well-known ingredient used in sensitive skin products. Therefore, due to this carefully selected composition, Caudalie micellar water is a hypo-allergenic, and can be used by people with sensitive skin. When applying Caudalie micellar water, the first thing I noticed is a discreet, but lovely smell - a mixture of Orange and Lemon flowers, and Peppermint leaves. It’s very light and refreshing. The micellar water is completely colorless. It removes all makeup from the face, such as foundation, lipstick, eyeshadow and blush. More pigmented makeup, such as mascara, requires a little more work. On the positive side, if you decide to use it for mascara removal, Caudalie micellar water is ophthalmologist tested, contains only mild ingredients and do not irritate sensitive eyes. Except for removing makeup, I use Caudalie micellar water for regular day and night skin cleansing. It removes excess oil or dirt from the skin surface, and leaves your skin perfectly soft and hydrated. And most importantly, it doesn’t cause any reactions on my face, but on the contrary, it reduces redness and irritation, which I tend to have during the winter period. 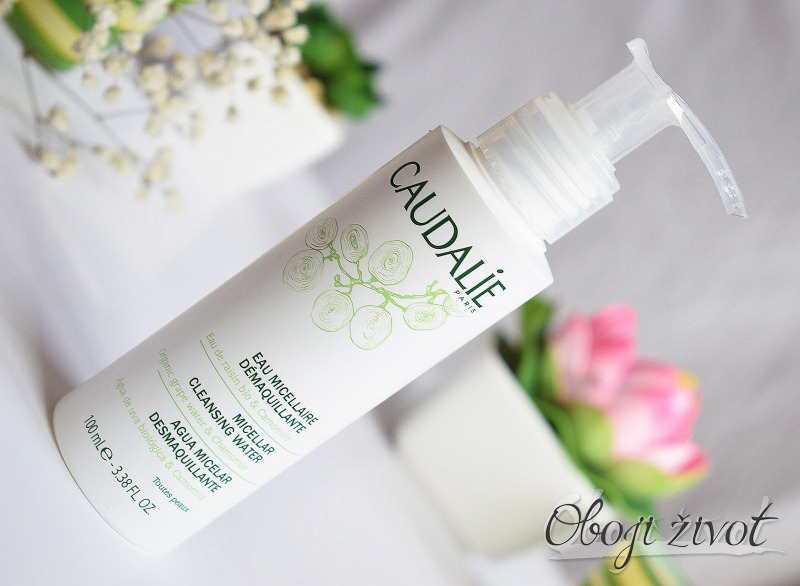 Did you already try Caudalie micellar water? Did you like it? ?